"The WWII generation took us from biplanes to the moon.... when they weren't saving the world." 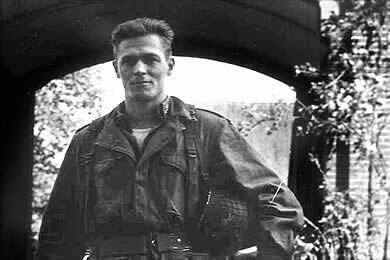 Major Richard Winters, of Band of Brothers fame has died at age 92. Winters never thought he was a hero, none of the true heroes of WW2 did. The real heroes never seem to realize they are. They simply think they were guys who did what they had to, for each other, to get through, but they were more than heroes. Men like Winters and the others who fought and suffered and died in that war saved the entire planet. Those soliders and their sweethearts, families, wives, and relatives were all heroes for what they did to stop the destruction of civilization and the ascendancy of evil. So God be with your family, and God rest you well, Major Winters. We can never repay the debt we owe those men and women... and it seems some times our culture is doing its damnest to do the opposite. Drew M posted a video of an interview with Richard Winters at the Ace of Spades HQ where I saw this sad news.